Virginia has a pretty wide and varied number of public festivals and events every year. There are wine festivals, Earth Day events, and music events like Floyd Fest. Sometimes they promote Virginia products or regions, and sometimes they benefit a specific group, like our friends at Earth Korps and their Belgravia Beer and Wine Festival. One thing that they all have in common is that they’re fun. The City of Richmond had its own this past weekend, and over 200,000 people joined in the revelry. We were overjoyed to attend and play a small part in the Richmond Folk Festival. 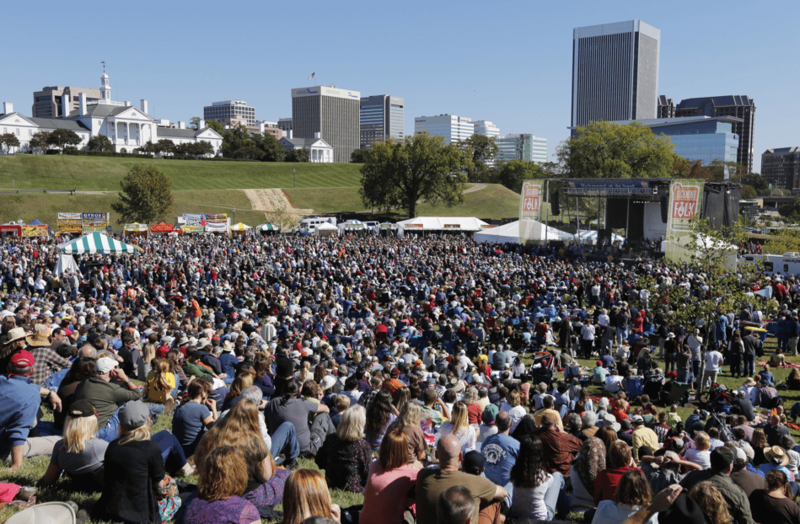 Our Capital city was the host to the National Folk Festival for several years, and when they pulled up stakes and moved to Nashville, Tennessee in 2007, Richmond decided to continue what was becoming a pretty successful gig. Over 30 groups performed on seven stages over the course of 2 ½ days. Bands of musicians and dancers from around the world entertained as merchants peddled crafts, served up delicious regional and ethnic foods, and demonstrations highlighted folklife and arts. We were able to partner with MeadWestvaco and the Richmond Clean City Commission to purchase 100 recycling carts. The City of Richmond keeps these carts in storage and are at the ready to pull them out for any and all events held within the City. We were able to pull out all of these carts and distribute them throughout the Richmond Folk Festival. The Folk Festival had a Green Team that worked throughout the event and kept everything tidy. You couldn’t miss the hundreds of volunteers in their green t-shirts and in addition to picking up trash and keeping things neat, they physically sorted through trash to make sure that everything that could be recycled was recycled. The Folk Festival, Venture Richmond and the Richmond Green Events Committee go to great lengths to make sure that this event has as small a footprint as possible. As you can imagine, a festival attended by 200,000 people will generate a great deal of trash, and much of that can be recycled. We were plenty pleased to see so many attendees make good use of the bins, and they were emptied continuously over the course of the weekend. We also placed almost 30 cigarette receptacles across the grounds, and they certainly went to good use. We handed out over 2,000 pocket ashtrays (they were almost as big a hit as Rosanne Cash! ), and over 5,000 people signed our banner, thereby pledging to join us in our mission to Keep Virginia Beautiful. We’ve engaged Virginians to sign our banner at other events, but we’ve never had one as full as this, and so many people making that promise. Again, we can’t say thank you enough for the help and support of MeadWestvaco and the Richmond Clean City Commission. And we certainly appreciated the help of a number of volunteers to distribute things and assist in cleaning things up. And our hats certainly are off to the Richmond Folk Festival, Venture Richmond, and the Richmond Green Events Committee. It’s easier to have a green event like this when you come out of the gate swinging, and these guys really care about that. And, yes, we got to see some great music and eat some wonderful food. But more than anything, we wanted to thank the thousands who came to the Folk Festival, used our recycling bins, put their cigarette butts where they were supposed to go, and joined our commitment to Keep Virginia Beautiful. Even with so many people gathered in one place, it can still be done.